1. The candidate’s maximum family income shall be Rs.1.00 Lakh per annum. 2. The candidate shall be a Graduate and he/she must fulfill eligibility conditions for appearing for Examinations to be conducted by the concerned recruiting agency. 3. Person who is a regular student in any course or already working in any post in any cadre is not eligible for this coaching. The selected candidate should deposit his/her Original TC, till he completes the free coaching along with proof on registration for exam. 4. Candidates who possess the qualifications required by the SBI, POs are only eligible to apply. 1. The final selection will be based on the merit of Degree marks of 10% weightage will be given for PG Students and reservations. So Selection process is based on merit in Graduation and with Reservation Rules. 2. 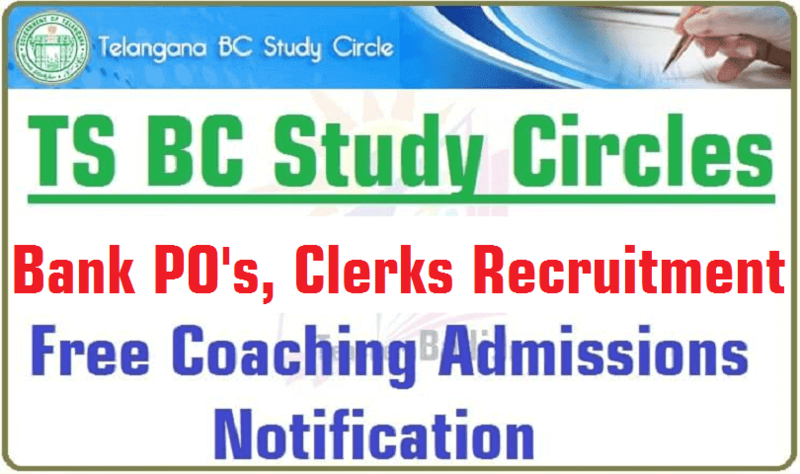 The candidates who have already availed any of the coaching earlier from any SC/ST/BC Study Circles are not eligible to take coaching once again. 1. The seats are allocated to the candidates of different categories as follows: BC- 66% (including Muslims categorized under BC-E), SC-20% & ST-14%. 2. Reservation to Physically Challenged is 3% and Women it is 33 1/3% respectively. 3. Unrepresented BC Community candidates physically challenged and Women candidates of the merit list are preferred in the vacancies, left if any. 9. Medak - 60 seats. 1. Selected candidates should submit Original Transfer Certificate to Study Circle and the same will be retained in the Study Circle during the coaching period. 2. The following Certificates must be uploaded online by the Candidate at the time Registration. g) Photograph of the Applicant. 1. Selected candidates must abide the Study Circle guidelines and attendance norms. Attendance & minimum marks in assessment is required for release of stipend. 2. Apart from free coaching, study material and either stipend will be provided. 1. The candidates shall register only through online in the website (http://tsbcstudycircles.cgg.gov.in) as per schedule. The last date for Online Registration for Bank Probationary Officers, Clerks see at web portal. For further details and Registration Guidelines, the Candidates is advised to visit the Website : http://tsbcstudycircles.cgg.gov.in. The Candidate may contact No. 040-24611408 further Details.